Gold as a kind of currency in the game is necessary. To make the most gold possible, you'll want to have multiple characters, some people to maximize gold rewards. Here are some tips to help you make gold. It's better to create a completely new character purely focusing on crafting. This character should have all crafting skills at max. This way you are going to have 2 characters: one being the dragonknight purely with a PvE build and the other one on the crafting. The good thing about this strategy is you can craft whatever you want as well as having a more powerful character. In your crafting character, you should have different skills for all crafting jobs including, woodworking, alchemy, clothing, enchanting, and more. Then, you can maximize based on what you need for. At least, you should maximize all crafting skills related to material extraction such as Metal Extraction, Unraveling, and wood extraction. They will give you a lot more gold from better-extracted items. The best way to make money in the Elder Scrolls Online with a small amount of time is Writs, a special assignment for crafting professions. 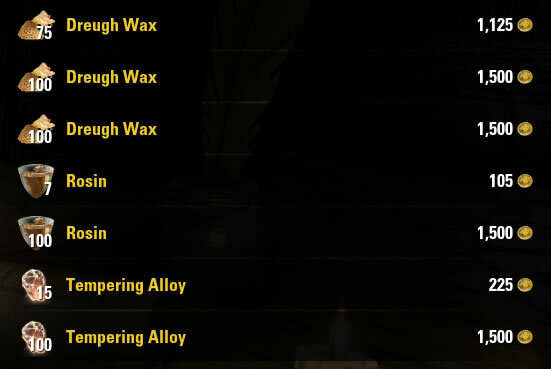 Completing a few writs give you a lot of gold as well as other crafting materials that can be crafted or sold later for gold. Even though hirelings aren't quite as profitable as they used to be, it's still long tern, passive income. At this point in time, the daily crafting writs are a good way to go. Enchanting and Alchemy are probably the best writs as well. Don't spend your money on any raw materials since the cost is way too high. Buy only refined materials at the guild store. Use just the base materials such as Iron Ingots, Rawhide, Jute, etc. They are less expensive to purchase and they take less per crafted item. Guild trader is a key to making profit in selling items to a player. Being in a guild is the only way to access it. Thus, you should join any guild as fast and as much as possible. There are many trading guilds allowing you to join them easily without having to PvP. When setting a price, make sure they are around the cheapest possible price without undercutting other players. Besides, you can get cheap eso gold on our online store.